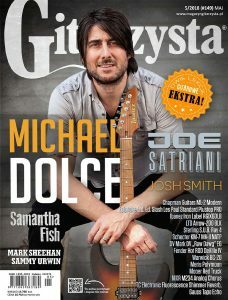 I don’t know how to describe in words how grateful and thankful I am to Przemysław Marciniak and all the publishing team at Magazyn Gitarzysta Poland’s number 1 Guitar magazine. Przemysław Marciniak asked me to do an interview for the magazine which then lead to having an 11-page feature as well as being featured on the front cover! This is something that I could not have ever imagined. Things even got more surreal when I looked at past issues and realised all my guitar heroes have been on the front cover. The magazine contains the interview, full breakdown, and description of all my gear, plus a full video lesson breakdown of my solo on “Most days”, from my Ibanez Promo clip. I have the English transcript of the interview for anyone that purchases the magazine! Just PM me. A massive thank you to Jordan Roach who took the photo for the front cover and interview photos.